Launch Date For Pillars of Eternity II: Deadfire Announced, Pre-Orders Now Live! We have great news today, so I'm going to hand it over to our awesome Community Manager, Aarik Dorobiala. Take it away, Aarik! Today, we are happy to announce that Pillars of Eternity II: Deadfire will launch on April 3rd, 2018 and that pre-orders are now available! There are three separate versions of the game to choose from: a base game edition, a Deluxe Edition with a bunch of digital goodies, and the Obsidian Edition, with digital goodies and the Season Pass. All three versions will be available on Obsidian.net, GOG.com, and Steam, as well as a bunch of other participating retailers. 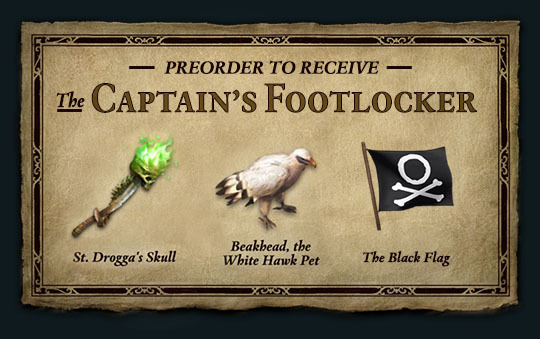 When you pre-order the game, you will also receive the Captain's Footlocker bundle! Now you might be asking yourself, "But Aarik, what if we already pledged on Fig and/or the Backer Portal?" Don't worry my friends, we got you covered! For those who have already backed the game through Fig or the Backer Portal, you'll be receiving the Captain's Locker along with your crowdfunding goodies! "Hold on Aarik," you might also retort, "if people can pre-order the game on Obsidian.net, GOG.com, and Steam, when will we be able to redeem our keys?" Excellent question my friends! We are actually working through that as you are reading this! We found some Xaurips messing around and causing havoc on our end, so you won't be able to redeem your key right away. We're working very diligently to ensure you guys are able to redeem your keys for Pillars of Eternity II: Deadfire from the Backer Portal. Thank you guys so much for all your love and support and we look forwards to seeing you explore the Deadfire. If you have any questions, please comment below. This is earlier than expected! YAY!!!! Hats off to the deadfire team and obsidian as a whole! You guys should be proud of discussing a timeline and delivering on it. Can’t wait! Great news. Also, anyone notice the writing on the boat? Any idea what it might mean, if anything? They been putting that stuff in the recent creature info tweets also. My wife is going to be PISSED when I start ignoring her in April.... thanks guys! as we mentioned in the sawyer tweets thread, this deadfire announcement comes almost exact relative to release as the poe announcement came relative to release. we assumed if a delay announcement for deadfire were gonna occur, using poe as a guide, it woulda already happened. announcement o' release date thus seemed imminent if obsidian were following patterns. our poe announcement guess were based on a guess o' an internal obsidian target o' the last tuesday o' the first fiscal quarter o' 2015, with actual slippage to first tuesday o' q2-- april 1, 2015. by the end of the first Q appeared to once again be the obsidian goal, so our guess woulda' been, as previous, first tuesday o' Q2-- april 3, 2018. so rather than unexpected, this announcement is pretty much exact as expected. freaky exact as expected. obsidian predictability is, ironic, the thing we see as unexpected. Also, it might be there just to show where the name of the ship will be available for us to see. Alright, so there is Standard, Deluxe, and Obsidian. I have "Premium" Digital + Pillars II DLC. I guess that means I have the Obsidian Package? This is going by the original backing schemes. Or is Premium a back thing unto it's own? Because I thought that backers would have unique bonuses not in any of the release packages. I'm also interested in this question and raise another - when will keys be sent? "Art and song are creations but so are weapons and lies"
"Our worst enemies are inventions of the mind. Pleasure. Fear. When we see them for what they are, we become unstoppable." On the plus side: That's earlier than expected!! On the down side: I won't have time for another Pillars run before its release now! Yay! I'm really happy about this. I have 300+ hours played on POE and its time to move on to a new game! Thanks for all the hard work, it's appreciated, truly. Fantastic, can't wait to play Deadfire!!! Nah, they're 5 character-based, for instance 3x5 chars. Technically it still holds true. Just like you i have the Premium Digital and P2 DLC. If you look at the Obsidian Package they are only going to get 1 in-game pet and 1 special in-game item. BUT the Premium Digital backer edition says that we will get 1 in-game pet and 2 special in-game items. Backer items and Pre-order items are separate. So Backers will be getting Fig rewards as well as the pre-order items! For those who are only purchasing by pre-order will only get those 3 items.